I am sharing with everyone a copy of what I have made for my daughter to be able to study this year's Latin memory work. All you need is a pair of scissors, two envelopes, a printer and a file folder! Easy peasy! 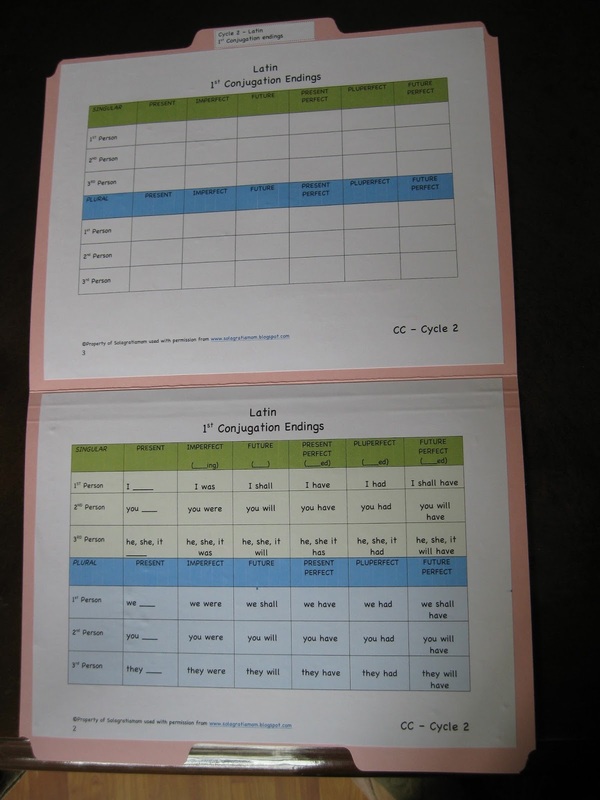 You can make this interactive folder for your child to learn the 1st Conjugation Endings for Latin. I used the same concept for last year's Latin and it can be made to be progressive with your child's learning level in the memory work. I start out with the pieces cut in columns. This way it only requires they first recognize the proper tense that the combination goes in and whether it's plural or singular. Once they have mastered that and can consistently match it up this way, then I would cut the pieces to be individual, requiring your child to recognize the proper person and whether it's plural, singular and the tense it falls under. Additionally, you can use the blank table from page 2 (above) to have them do their copywork on. Just print an extra copy of this page and put a page protector over it or laminate it. Then you can have them write in their copywork with a dry erase marker for the Latin when they're ready to progress to that level. I intentionally did not make a label for the cover. This way your child can make their own cover by drawing a picture, putting stickers or whatever they would like to make the Latin matching folder their own this year. I think it adds an element of "buy in" to the whole idea of doing their Latin! This is a favorite way to "teach" the Latin each year! You can get a FREE copy of this document to print yourself and make. All you have to do is click on the above link under the pink flower folder. This will be included with the Year 2 - Weeks 1-24 Enrichment Teaching Plan which is ready to be released the end of this week! Yay!!! THANK YOU for this great resource!!! I would love to link my blog to this resource. Is that okay? Thank you, again, so so much!! HI Suzanne - You may link to this blogpost to make the resource available to your readers. Thank you for viewing and I'm glad it will bless you this year. I enjoy reading your blog as well. God bless! I tried to access this but the link did not work. Can you help? This looks wonderful. Do you have a freebie for the similar concept you used in Cycle 1? I'd love to print it... I love this Cycle 2! Will be using it in my class I tutor in CC in Birmingham, AL! I'm glad it will help you! I don't have one for Cycle 1 - but will when we get there I imagine! :) Thanks for viewing! Hi Colleen! Thank you for sharing your work with us on the CC Cycle 2 Weekly Link-Up! Hi Colleen! This is our first year in classical, I just curious how your typical week goes? You are a total blessing to the CC Community. Thank you!! I was trying to print this great resource off and it won't allow me to. Am I missing something? Thank you, this will be GREAT! Even for my Challenge A student! If you e-mail me then I'll be glad to send it to you directly. It is located in google docs -but I'll send as an attachment if you e-mail me. Thanks for sharing your hard work so we don't have to reinvent the wheel!